Last few days for my Christmas books on KU! My previous year’s Christmas books will come off KU and go back on wide distribution on Feb 10th. So if you want to read any of them on Kindle Unlimited, do it now! Also, my Christmas book for 2018, CHRISTMAS ANGEL, will go off KU and into wide distribution on March 1. I hope you all had a good January. I’m working on a book called FAMILY CAMP and should be able to share a cover and blurb with you soon! More Christmas goodies! I haven’t had nearly as much time to read this season as I’d like, but here are some new Christmas books I read and recommend. The Christmas Angel Series. 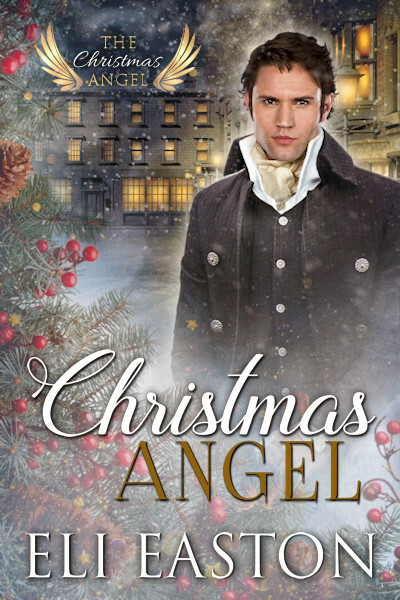 I’ve now read nearly all the books in The Christmas Angel series, a series I have a book in myself. I love N.R. Walker’s books as a rule, and this one was particularly good. 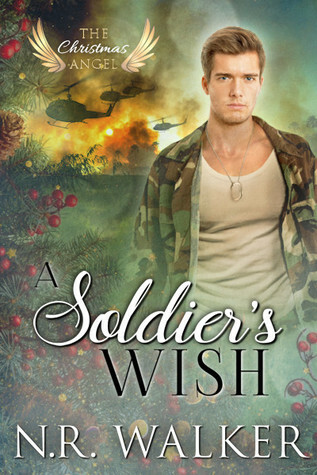 I loved the 60’s setting and the hurt/comfort aspect of the book when her Vietnam soldier comes home wounded. Read it! The Christmas Angel Series. Anyta Sunday’s contribution to the series is really fun. Her story is based on “The Taming of the Shrew”. Pax Polo is a great character, witty, clever, and always has an angle. He starts of trying to distract the “shrew” next door (the older brother of a lovely young woman) in order to give Pax’s roommate and a business associate a chance to court the girl. But he ends up falling of the shrew. Really well-done. Keira is another favorite author of mine. In this Christmas-y tale, she has a hunky, grumpy lumberjack character who is roped into playing Santa. He and his younger, twinky elf find they’re a perfect match. Steamy holiday fun. I met Ella and Brooke at Y/Con in Paris in December, so I was eager to check out their Christmas book. It’s a fun, light rom com featuring a guy who meets the man of his dreams briefly, but when he goes home for Christmas, the same guy shows up as his sister’s boyfriend. It’s all a mix-up and the angst is very light. Well-written and definitely recommended. It has a Hallmark feel, which I loved. I’m heading out for 10 days in Seattle for the holidays. Hopefully I’ll get to read more holiday goodness. Have a very merry Christmas and a happy New Year! See you in 2019. My first Christmas season read of 2018 and I loved it. Ben and Adam meet when Adam walks into Ben's "kosher style" bakery in Boston while travelling there with the ice hockey team he coaches (he's from Montreal). Both men have similar histories. Both were skaters (one hockey, one a speed skater) who had to give up on dreams of Olympic glory. Both are Jewish, though Adam's father was a rabbi and Ben's family was unobservant. I loved Adam's young hockey players--they sounded like real kids and added a family flavor to the story. And Ben and Adam were sweet together, earnest guys who have some bumps along the way to trusting one another. Highly recommended. A lovely Christmas book from Annabeth Albert. It features a retiring Sergeant Major from the military MP who believes he's over the hill and who has a job lined up in Florida, and a young social worker who lives in a small, cold, northern town stuffed full of his relatives. When the military guy, Nick, is roped into playing Santa for the social worker, Teddy's, community fund raiser, Teddy is star struck immediately. It takes Nick longer to warm up to the idea of having the younger man in his bed and longer still for him to admit they have something worth changing his vision of his future for. I love Christmas stories that have lot of snow and extended family fun, and this one has that in spades. Fun, sweet, and hot. Highly recommended! I’m in a series this year with six other amazing authors, so I am slowly reading through the other books in the series. The entire series releases Dec 2nd. My book is CHRISTMAS ANGEL, which you can read about here. So far I’ve read Kim Fielding and RJ Scott’s entries, and I loved them both. I loved the fairytale-like royal setting of this story, in the beautiful little kingdom of Montaunoit with the snow and tons of Christmas lights, Christmas market, hidden passages and archives in the palace, etc. The Christmas Angel is believed by the palace staff to be a "golden ghost" and she has a nice influence in this story, steering Prince Rafe and the British Museum historian, Marc, to true love. I always enjoy RJ's Christmas books and this one will be one of my favorites. This historical is a lot of fun. It's set in 1880's New York, which is an unusual period for a romance. It features the son of a wealthy department store owner and a rough cowboy who is a bit of a fish out of water in New York. The romance is sweet. I loved the way Kim used the angel ornament as a kind of guardian angel figure in their lives, urging them together. Great and hopeful ending. I always love Kim's books and this is no exception. Lots more Christmas books in the pipeline. It’s not even December yet! Whee! More reviews soon.